Early tomorrow morning (local time) a WSPA Disaster Assessment and Response Team (DART) from the WSPA Asia office will depart for Japan, following days of monitoring the situation from afar and keeping up constant discussion with partner organisations within Japan. 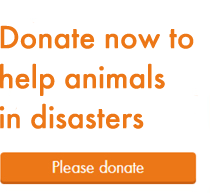 Dr. Ian Dacre and Dr. Damian Woodberry, two WSPA vets with years of experience in operations to help animals in disasters, will start by signing up to join the ‘shelter cluster’ coordinated by the United Nations Office for the Coordination of Humanitarian Affairs (OCHA). As OCHA has stated in its Situation Report of 14 March, “search and rescue remains the priority in tsunami and earthquake affected areas”. Considering the large numbers of people that will need to be housed in temporary shelters, as we reported yesterday, we expect there to be a significant impact on the animals that were part of these families. The WSPA team are also hoping to meet with contacts in the Japanese Ministry of Agriculture, Forestry and Fisheries MAFF) as well as the Ministry of Environment (MoE), who have already been informed of our willingness to support their efforts in the field. Meanwhile we’ve received a very positive update from our member society the Kanagawa Society for Prevention of Cruelty to Animals (KSPCA); they inform us that several animal welfare groups in Japan have come together to launch a coordinated effort to help the animals affected by last week’s quake and resultant tsunami. Being present in Japan will mean that the WSPA DART are able to extend more tangible support to these groups working in the field, who with their presence on the ground, have a far superior understanding of the needs facing animals in Japan right now.